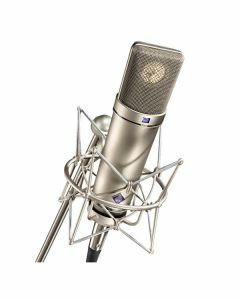 Neumann’s U 87 Ai condenser microphone is a large diaphragm microphone with three polar patterns and a distinctive frequency and transient response quality. It is a respectable option for the majority of general purpose applications in studios, for broadcasting, film and television. Users know the microphone almost immediately by its unique design. The U 87 Ai is deployed significantly as a vocal microphone for all kinds of music and speech, as a main microphone for orchestra recordings and as a spot mic for single instruments. The U 87 offers a variety of features and versatility that make it to one of the most desirable mics available. Your ideal choice for a vocal microphone, suited to all types of music and speech, it’s renowned for its warm and well balanced characteristics. The U 87 is armed with a large dual-diaphragm capsule with three directional patterns: omnidirectional, cardioid and figure-8. These are selectable with a switch below the headgrille. A 10 dB attenuation switch is situated on the rear. It enables the microphone to deal with sound pressure levels up to 127 dB without distortion. Furthermore, the low frequency response can be reduced to compensate for proximity effect.